More often than not, when the GROUP command comes up in discussion it’s because a user can’t figure out why their selection sets are going crazy. Hence the reason I titled this post “GROUP Therapy”. But in all seriousness, GROUPS can prove handy when you, and more importantly, your co-workers understand what they are and how to use them. Blocks are of course quite powerful in the way they collect some number of AutoCAD objects, and package them into a single object. As we all know the number of uses of blocks and duct tape are directly proportional to one another. On the other hand wouldn’t it be nice if we could toggle a block on and off? This is where the GROUP command comes in. By definition a GROUP is a collection of objects that can be selected and modified as one, or individually as needed. GROUP’s can be defined anonymously or by name. As illustrated above, my GROUP names look something like *A1, thus having an anonymous name. Defining a GROUP is done with, you guessed it, the GROUP command. The group name can be anything you would like so long as it meets a few rules. It must be alphanumeric, or use the dollar sign ($), hyphen (-), or underscore(_). The name cannot contain any spaces, nor be anymore than 31 characters in length. Selecting the “Unnamed” checkbox will let you create a group anonymously. With your name defined, simply press the [New] button and select the objects you would like to group. An interesting thing about groups is how they behave when selected. Groups work more like selection sets as opposed to objects. Thus when you select them, your Properties Task Pane will list your group as Lines, Arc’s, etc, not as a group object. 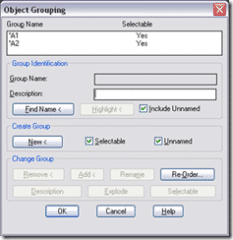 If you would like to identify the group in which an object belongs, go to the GROUP command. Using the [Find Name} button you can select an object in AutoCAD, and the dialog then tell you which group an object is associated with. 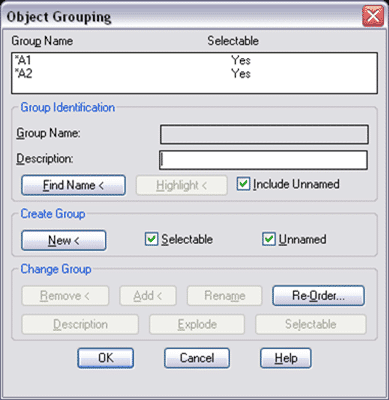 To append a group, select it’s name from the GROUP dialog. Upon selecting the buttons at the bottom of the dialog will be enabled. Using them you can do things like Remove, Add, Rename, Explode, etc. At the beginning of this post I promised you could toggle GROUP’s on/off. The PICKSTYLE system variable controls whether of not a group is selectable. A little quicker way to toggle the PICKSTYLE variable is to press Ctrl + H at the same time. Admittedly, the GROUP command is rather unique. Few CAD users seem to know about Groups, and for that reason become miffed when they come across them. Regardless if you choose to use them or not, at least you know what to do the next time you encounter one of these guys. I have Autocad 2008 and the command OVERKILL dont work. why? I installed ready the express toll too. please tell me what I have to do? Currently I can add entities into a selection set then make that selection set into a group. I can see if and entity is part of a group and what that group name is (even an anonomus group). I can determine if the group is selectable or not, if it is make it not-selectable. I then can move, erase then when complete change it back to selectable (to act as one cohesive group again). How do I add one entity to an existing group with LISP? Or in Visual Lisp if that is my only way?